How do people process, and behave in response to, risk information about zoonotic disease? Zoonotic diseases pose risks to ecosystems, economies, and human health worldwide. Assuming different people judge risk management strategies the same can result in failed risk management. If perceptions of disease risk are to be effectively attended to by risk managers through risk communication, context-specific knowledge of risk is critical for affecting people’s attitudes and behavior. This project explored demographics and zoonotic disease-related risk perceptions, testing the efficacy of a persuasive risk communication campaign on risk perceptions, evaluating bovine tuberculosis risk communication materials in Michigan and Minnesota for severity, susceptibility and efficacy messages, and theory testing the cognitive hierarchy model based on risks from disease and management policies. A test of communication in changing harvest behaviors of deer hunters. Triezenberg, H. A., Riley, S. J., and M. L. Gore. (2016). Wildlife Society Bulletin. DOI: 10.1002/jwmg.21078. Measuring flow in Michigan youth firearm deer hunters: implications for measurement and practice. Everett, M. W., and M.L. Gore. (2015). Society and Leisure, 38(1): 100-109. 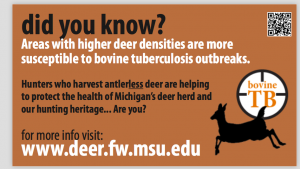 Persuasive communication aimed at achieving wildlife-disease management goals. Triezenberg, H.A., Gore, M. L., Riley, S. J., and M.K. Lapinski. (2014). Wildlife Society Bulletin, 38(4): 734-740. Perceived risks from disease and management policies: an expansion and testing of a zoonotic disease risk perception model. Triezenberg, H.A., Gore, M. L., Riley, S. J., and M.K. Lapinski. (2014). Human Dimensions of Wildlife, 19(2). Wildlife disease and risk perception. Hanisch-Kirkbride, S. L., Riley, S. J., and M. L. Gore. (2013). Journal of Wildlife Diseases, 49(4): 841-849. Evaluating bovine tuberculosis risk communication materials in Michigan and Minnesota for severity, susceptibility and efficacy messages. Muter, B. A., Gore, M. L., and S. J. Riley. (2013). Wildlife Society Bulletin, 37(1): 115-121. When wildlife and livestock go nose-to-nose: a review of bovine tuberculosis management policies in Michigan and Minnesota. Riley, S. J., Muter, B. A., and M. L. Gore (2010). Report prepared for the Michigan State University Agricultural Experiment Station, East Lansing, MI. 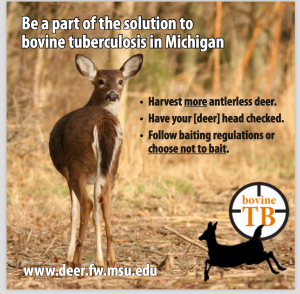 Expert perspectives on bovine tuberculosis management policies in Michigan and Minnesota. Riley, S. J., Muter, B. A., and M. L Gore. (2010). Michigan State University Department of Fisheries & Wildlife, East Lansing, MI.